Burning of David and Levina, Ghent, 1554. Engraving by Jan Luiken in Martyrs' Mirror, v. 2, p. 161 of Dutch edition. 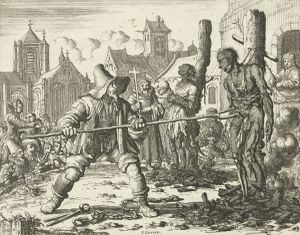 David van der Leyen (or Verleyen), an Anabaptist martyr, was executed with Levina Ghyselius at Ghent, Belgium on 14 February 1554 by burning at the stake. The first information we have about these two martyrs is found in the Liedtboecxken van den Offer des Heeren (1562) where they are celebrated in a song (No. 7) beginning: "Ghy Christen al te samen, bereyt u tot ten strijt" (You Christians all together, prepare for the conflict). It is also included by Wolkan. Another song about David and Levina is found in the Nieu Liedtboecxken (1562 and later editions): "Och Heere ic moet u claghen" (Oh Lord, I must complain to Thee), also found in Wackernagel. The later accounts including that of the Martyrs' Mirror, are prose adaptations of these songs. The Liedtboecxken song says that David was a young man who firmly confessed his faith and steadfastly suffered all vexations both of body and mind, and that after the fire had gone out, David was miraculously still alive. Many members of the van der Leyen family at Ghent were suspected of heresy and some of them died as martyrs: Tanneken on 27 August 1555, at Antwerp; Franchois on 28 April 1558, at Ghent; Laureys on 8 November 1559, at Antwerp. According to an old chronicle of Ghent David's father was also a Mennonite, but because he was dangerously ill, the count gave up further persecution. The noted von der Leyen family of Krefeld does not stem from the Flemish van der Leyens, as has sometimes been asserted. Braght, Thieleman J. van. Het Bloedigh Tooneel of Martelaers Spiegel der Doops-gesinde of Weereloose Christenen, Die om 't getuygenis van Jesus haren Salighmaker geleden hebben ende gedood zijn van Christi tijd of tot desen tijd toe. Den Tweeden Druk. Amsterdam: Hieronymus Sweerts, 1685: Part II, 160 ff. Braght, Thieleman J. van. The Bloody Theatre or Martyrs' Mirror of the Defenseless Christians Who Baptized Only upon Confession of Faith and Who Suffered and Died for the Testimony of Jesus Their Saviour . . . to the Year A.D. 1660. Scottdale, PA: Herald Press, 1951: 549. Available online at: http://www.homecomers.org/mirror/index.htm. Hege, Christian and Christian Neff. Mennonitisches Lexikon, 4 vols. Frankfurt & Weierhof: Hege; Karlsruhe; Schneider, 1913-1967. v. II, 645 ff. Wackernagel, Philipp. Lieder der niederlandischen Reformierten aus der Zeit der Verfolgung im 16. Jahrhundert. Frankfurt: Hender & Zimmer, 1867. Reprinted Nieuwkoop: B. de Graaf, 1965: 132. Wolkan, Rudolf. Die Lieder der Wiedertäufer. Berlin, 1903. Reprinted Nieuwkoop: B. De Graaf, 1965. .
Zijpp, Nanne van der. "David van der Leyen (d. 1554)." Global Anabaptist Mennonite Encyclopedia Online. 1956. Web. 21 Apr 2019. http://gameo.org/index.php?title=David_van_der_Leyen_(d._1554)&oldid=162724. Zijpp, Nanne van der. (1956). David van der Leyen (d. 1554). Global Anabaptist Mennonite Encyclopedia Online. Retrieved 21 April 2019, from http://gameo.org/index.php?title=David_van_der_Leyen_(d._1554)&oldid=162724. Adapted by permission of Herald Press, Harrisonburg, Virginia, from Mennonite Encyclopedia, Vol. 2, p. 19. All rights reserved. This page was last modified on 17 December 2018, at 11:51.